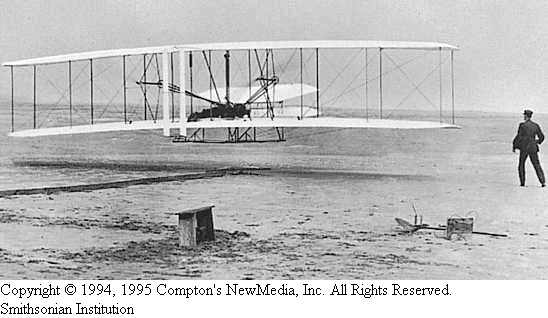 In the fall of 1903 the Wright brothers shipped their airplane to Kitty Hawk, on the coast of North Carolina. Here they had tested their gliders previously because of the hills and steady winds. 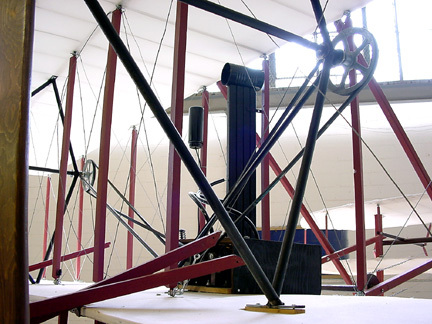 On Dec. 17, 1903, Orville made the first flight, which lasted 12 seconds and covered 120 feet. 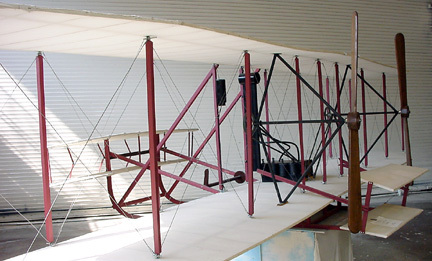 The Wrights improved their machine so that by 1905 they could fly more than 24 miles in 38 minutes. 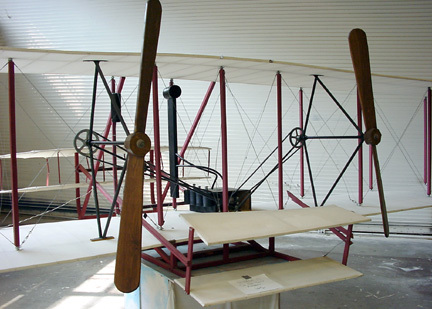 In 1908 Wilbur went to France and flew a Wright machine before the royalty of Europe. 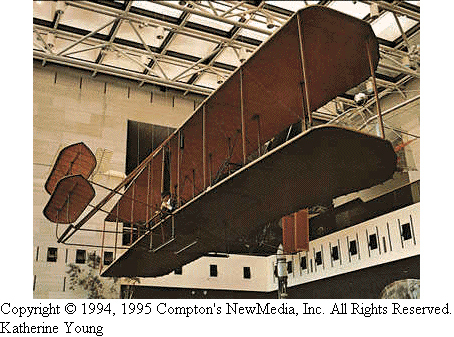 That same year Orville demonstrated one of the Wright planes at Fort Myer, Va., before government officials. During one of his flights, Orville took up a passenger, Lieut. Thomas E. Selfridge of the United States Army Signal Corps. Trouble developed and the plane crashed, killing Selfridge. He was the first person to be killed in an airplane crash. This historic photograph shows Orville Wright making the first powered flight in a heavier-than air craft on December 17, 1903 near Kitty Hawk, N.C.. His brother Wilber runs alongside. Smithsonian Institute. The Wright Brothers Flyer now hangs in the Smithsonian's Milestones of Flight hall. Wright Orville 1871-1948 and Wilbur 1867-1912: US inventors; brothers who pioneered piloted, powered flight. Inspired by Otto Lilienthal's gliding, they perfected their piloted glider 1902. In 1903 they built a powered machine, a 12- hp 341-kg/750-lb plane, and became the first to make a successful powered flight, near Kitty Hawk, North Carolina. Orville flew 36.6 m/120 ft in 12 sec; Wilbur, 260 m/852 ft in 59 sec. Both brothers were born in Dayton, Ohio, and became interested in flight at early ages. They devised a wing-control system and added a rudder and a balancing tail to existing gliders. By 1903 they had built and flown a power-driven plane; they received a patent in 1906 and in 1909 set up the American Wright Corp to produce planes for the War Department. After Wilbur's death Orville did research and served on the National Advisory Committee for Aeronautics 1915-48. Note: Due to the security situation at Teterboro Airport following September 11, 2001, the NJ Aviation Hall of Fame's Annual 'Wings and Wheels' show was cancelled for 2002. The Museum hopes to continue with the Wings and Wheels event and the Tri-State Aviation Expo in 2003.